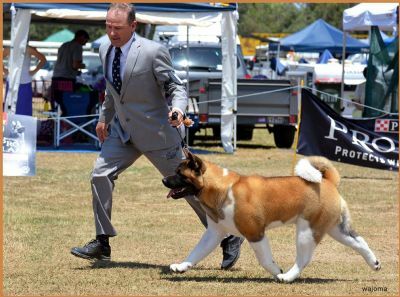 With an amazing pedigree and the first AM CH REGALIA'S FLAGSTONE son in Australasia produced but not the last we thank our dear friend Margaret for entrusting us with this very special boy. 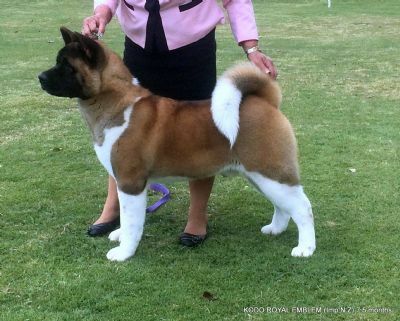 George is a lovely example of the Akita with his massive bone substance size balance colour and a head piece to die for and with correct powerful brisk movement. 18th October 2014 George was awarded Puppy In Group under utility specialist M S Yianno and then was awarded Puppy In Show Under respected All Breeds Judge Mr A Brown. 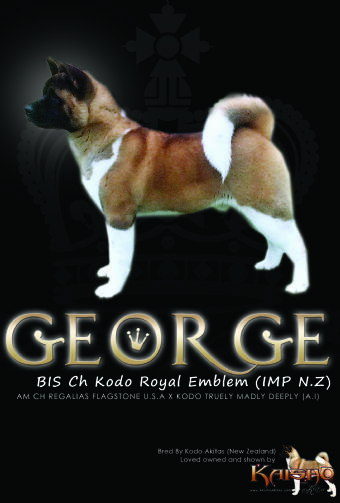 21st November 2014 sees George take his Fist Runner Up In Group Award and Puppy In Show under Akita Specialist and highly respected International All breeds judge Mr M Valid (India) at 9 months of age. 24th Janurary 2015 George attained his Championship title with a BEST IN SHOW at 11 months Huge Thank you to esteemed All Breeds Judge Mrs L Black Victoria for this award. George at 11 months has attained in limited showing. 1 BEST IN SHOW AWARD 2 BIG and 1 RUIG 18 Class In Group Awards and 7 Class In Show Awards ! Impressive as we have only attended 23 shows with our beautiful George. We exhibit at metropolitan shows and being consistently awarded in limited showing under Local, Interstate International Judges is such an honour! A Huge thankyou to all the Judges that have Awarded our George. We look forward to a very exciting future.